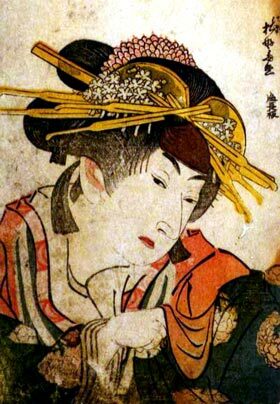 11th lunar month of 1771: Iroha played at the Minamigawa no Shibai the role of Princess Karamatsu in the kaomise drama "Bandai Isaoshi Genji", which was produced by Arashi Sanjûrô II. 11th lunar month of 1773: Iroha produced in Kyôto the kaomise drama "Etari ya Etari Tsuwamono Majiwari". 18th day of the 11th lunar month of 1774 : his father Yoshizawa Ayame III died. 9th lunar month of 1781: Iroha produced in Ôsaka at the Kado no Shibai the drama "Imoseyama Onna Teikin", in which he played the roles of Koganosuke and Princess Tachibana; his stage partners were Nakamura Tomijûrô I (Omiwa, Sadaka), Nakamura Utaemon I (Soga no Iruka), Nakayama Bunshichi I (Daihanji no Kiyosumi, Shibaroku) and Nakamura Noshio II (Hinadori). 1st lunar month of 1782: the play "Tengajaya-mura" was staged for the first time in Kyôto, at the Kitagawa no Shibai; Iroha played the role of Somenoi [casting]. 5th lunar month of 1784: premiere at the Kado no Shibai of Nagawa Shimesuke I's drama "Sumidagawa Gonichi no Omokage"; Iroha played the role of Okumi [casting]. 11th lunar month of 1784: Iroha played at the Kado no Shibai the roles of Yae and Tonami in the drama "Sugawara Denju Tenarai Kagami", which was produced by Onoe Ushinosuke I. 2nd lunar month of 1788: premiere at the Ônishi no Shibai of the drama "Gishinden Yomikiri Kôshaku"; Iroha played the roles of Kaoyo Gozen, Okaru and Osono [more details]. It was supposed to be staged first in Kyôto at the beginning of the month at the Nishi no Shibai but the theater was destroyed by fire the 29th day of the 1st lunar month. The troupe went to Ôsaka to perform at the Ônishi no Shibai and to celebrate the shûmei of Kataoka Nizaemon VII. 9th lunar month of 1791: premiere of Nagawa Shimesuke I's chûshinguramono "Iroha Gana Shijûshichi Moji" in Ôsaka at the Kado no Shibai; Iroha played the roles of the keisei Kashiwagi, the nakai Okaru and Yajibê's musume [more details]. 28th day of the 9th lunar month of 1792 : Yoshizawa Ayame IV died. 1st lunar month of 1793: premiere at the Naka no Shibai of the ni-no-kawari drama "Keisei Yanagi Zakura", the first yanagisawa-sôdômono in Kabuki history, written by Tatsuoka Mansaku and Chikamatsu Tokusô; Iroha played the roles of the keisei Azuma and Yoshinori's kôshitsu [more details]. 1st lunar month of 1794: Iroha's rank in the Kyôto hyôbanki, wakaonnagata section, was jô-jô-kichi (superior - superior - excellent). 2nd lunar month of 1794: premiere at the Naka no Shibai of Namiki Gohei I's drama "Shima Meguri Uso no Kikigaki"; the last scenes were a sewamono drama, which was staged independently in the 5th lunar month of 1794 under the title "Godairiki Koi no Fûjime"; Iroha played the role of the courtesan Kikuno [more details]. 11th lunar month of 1794: Iroha played the role of Princess Miyuki in the drama "Kana Utsushi Azuchi Mondô", which was produced by Nakayama Yosaburô II at the Naka no Shibai. 1st lunar month of 1795: Iroha's rank in the Ôsaka hyôbanki, wakaonnagata section, was jô-jô-kichi (superior - superior - excellent). 8th lunar month of 1795: Iroha played at the Naka no Shibai the roles of Okaru and Osono in the drama "Kanadehon Chûshingura". 2nd lunar month of 1796: Suga Sensuke's puppet theater drama "Keisei Koi no Hikyaku" was adapted for Kabuki for the first time and staged at the Kado no Shibai; Iroha played the role of Umegawa [casting]. 4th lunar month of 1796: premiere at the Kado no Shibai of the drama "Hade Kurabe Ishikawazome", written by Chikamatsu Tokuzô, Tatsuoka Mansaku and Namiki Shôzô II; Iroha played the roles of Ishida's daughter and Takigawa [more details]. 7th lunar month of 1796: premiere in Ôsaka at the Kado no Shibai of the drama "Ise Ondo Koi no Netaba"; Iroha played the role of the courtesan Okon [casting]. 5th lunar month of 1798: Iroha played the role of Otatsu in the drama "Natsu Matsuri Naniwa Kagami", which was produced by Nakayama Yosaburô II at the Kado no Shibai; his stage partners were Kataoka Nizaemon VII (Danshichi Kurobê), Nakayama Bunzô (Issun Tokubê), Yamashita Kinsaku II (Okaji) and Seki Sanjûrô I (Tsuribune Sabu). 11th lunar month of 1800: first Kabuki adaptation of Chikamatsu Yanagi's puppet theater drama "Ehon Taikôki", which was produced by Nakayama Tokujirô in Ôsaka at the Kado no Shibai; Iroha played the role of Misao [casting]. 1st lunar month of 1801: Iroha was the kanjiku for the onnagata actors in the Ôsaka hyôbanki. 10th lunar month of 1801: Iroha played at the Naka no Shibai the roles of Karaki Masaemon's wife Otane and Sasaki Tan'emon's wife Sasao in the drama "Igagoe Norikake Gappa", which was produced by Yamashita Tokujirô; the roles of Karaki Masaemon and Sasaki Tan'emon were played by Kataoka Nizaemon VII and Arashi Kichisaburô II. 11th lunar month of 1801: the troupe which was at the Naka no Shibai moved to Kyôto to perform the same drama, which was produced by Arashi Kumanosuke at the Minamigawa no Shibai. 1st lunar month of 1802: Iroha's rank in the Kamigata hyôbanki, wakaonnagata section, was hakudai-jô-jô-kichi (almost grand - superior - superior - excellent). Summer 1802: the drama "Ehon Taikôki" was staged for the first time in Kyôto, at the Kitagawa no Shibai; it was produced by Arashi Sangorô III and Iroha played the role of Misao [casting]. 11th lunar month of 1802: Iroha took part in the kaomise drama "Fûryû Kokusen'ya", which was produced by Azuma Tomijirô at the Kitagawa no Shibai and celebrated the shûmei of Nakayama Shinkurô III. His stage partners were Ichikawa Danzô IV, Arashi Sangorô III, Arashi Kichisaburô II, Sawamura Kunitarô I, Nakayama Bungorô I and Kanô Minshi I. 11th lunar month of 1803: Iroha took part in the kaomise drama "Sôzoku Ishibashiyama", which was staged at the Naka no Shibai and celebrated the shûmei of Asao Tamejûrô II. His stage partners were Ichikawa Danzô IV, Bandô Hikosaburô III, Nakamura Daikichi I and Nakayama Shinkurô III. 12th lunar month of 1803: Iroha played in the same theater the role of Chiyo in the drama "Sugawara Denju Tenarai Kagami". 1st lunar month of 1804: the troupe which was at the Naka no Shibai moved to Kyôto to perform again in "Sugawara Denju Tenarai Kagami". 2nd lunar month of 1804: the troupe went back to Ôsaka; Iroha played the roles of Sadaka and Princess Tachibana in the drama "Imoseyama Onna Teikin"; the role of Daihanji no Kiyosumi was played by the Edo star Bandô Hikosaburô III. 10th lunar month of 1804: Iroha played at the Kita-Shinchi no Shibai (Ósaka) the role of Osono in the drama "Akiba Gongen Kaisen Banashi"; the roles of Rokusuke and Kyôgoku no Takumi were played by Ichikawa Danzô IV and Ôtani Tomoemon II. 11th lunar month of 1804: Iroha took part at the Naka no Shibai in the kaomise "Minoriyoshi Kane no Naruki", which was produced by his son Yoshizawa Enjirô I; his stage partners were Kataoka Nizaemon VII, Ichikawa Danzô IV, Arashi Sangorô III and Asao Kuzaemon I. 12th lunar month of 1804: Iroha played in the same theater the role of Osono in the drama "Akiba Gongen Kaisen Banashi"; the role of Rokusuke was played by Ichikawa Danzô IV. 3rd lunar month of 1805: Iroha played in the same theater the roles of Okaru and Osono in the drama "Kanadehon Chûshingura". 11th lunar month of 1805: Iroha played at the Minamigawa no Shibai the role of Shizuka Gozen in the drama "Yoshitsune Senbon Zakura"; the role of Tadanobu was played by Nakamura Utaemon III. 12th lunar month of 1805: the troupe which was at the Minamigawa no Shibai moved to Ôsaka to perform the same drama, which was produced by Yamashita Tokujirô at the Naka no Shibai. 4th ~ 6th lunar months of 1806: tour in Nagoya for a troupe led by Iroha, Arashi Kichisaburô II, Arashi Sangorô III, Sawamura Tanosuke II and Nakayama Bungorô I; they performed at the Tachibana no Shibai in dramas like "Keisei Sakura no Shima", "Gion Sairei Shinkôki", "Hirakana Seisuiki", "Sarumawashi Kadode no Hitofushi" or "Komochi Yamanba". 12th lunar month of 1806: Iroha took part in the kaomise drama "Ôsakazuki Asahi no Hôrai", which was produced at the Kado no Shibai by Yoshizawa Minosuke and starred Ichikawa Danzô IV, Nakamura Utaemon III, Kataoka Nizaemon VII, Nakamura Daikichi I, Nakamura Noshio III and Ogino Izaburô II. Spring 1807: tour in Ise with Ichikawa Danzô IV. 11th lunar month of 1807: Yoshizawa Iroha I took the name of Yoshizawa Ayame V in Kyôto at the Kitagawa no Shibai, playing the role of Sekijo in the drama "Yoshitsune Koshigoejô"; his stage partners were Seki Sanjûrô II, Asao Kuzaemon I, Nakamura Karoku I, Nakayama Shinkurô III, Nakayama Bungorô I, Nakamura Kumetarô II and Kiriyama Monji III; his disciple Yoshizawa Minosuke took the name of Yoshizawa Sakinosuke IV. 1st lunar month of 1808: Ayame's rank in the Kamigata hyôbanki, wakaonnagata section, was shin-jô-jô-kichi (truly - superior - superior - excellent). 3rd lunar month of 1808: "Hachijin Shugo no Honjô" was adapted for Kabuki for the first time, in Kyôto at the Kitagawa no Shibai; Ayame played the roles of Asakiyo's okugata Hazue and the menoto Yasose [casting]. 11th lunar month of 1808: Ayame took part at the Naka no Shibai in the kaomise drama "Shima Meguri Tsuki no Yumihari". 5th lunar month of 1809: Ayame played at the Naka no Shibai the role of Owasa in the drama "Gosho Zakura Horikawa no Youchi"; the role of Benkei was played by Kataoka Nizaemon VII. He also played the role of Tonami in the drama "Sugawara Denju Tenarai Kagami". 11th lunar month of 1809: Ayame played at the Kado no Shibai in the kaomise drama "Keishoku Yuki-miru Yama", which was produced by Mimasu Kumesaburô and starred Nakayama Hyakka, Arashi Kichisaburô II, Asao Kuzaemon I, Nakayama Shinkurô III, Nakamura Daikichi I, Kanô Minshi I and Asao Okuyama III. 1st lunar month of 1810: premiere at the Kado no Shibai of Chikamatsu Tokuzô and Namiki Miyosuke ni-no-kawari drama "Keisei Sato no Funauta"; Ayame played the roles of Ikkaku's wife Mayumi, Ofuji and Osawa [casting]; this was Ayame's last appearance on stage! 26th day of the 8th lunar month of 1810 : Ayame died in Ôsaka. Yoshizawa Ayame V was a talented onnagata actor, endowed with a great appearance and excelling in keisei roles. His vocal projection was perfect and he was more at ease in sewamono than in jidaimono. The 26th day of the 8th lunar month of the 7th year of the Bunka era was the 24th of September 1810 in the western calendar. The 28th day of the 9th lunar month of the 4th year of the Kansei era was the 12th of November 1792 in the western calendar.